It’s the red one. A 1992 Folkboat. And mine. I looked at boats to buy back in 2000. Somehow that was 15 years ago. It just flies by when you’re having fun. I was a different person then, with different dreams and expectations. I wanted a house in Oxford, or maybe just outside it on the London side. I’d sold the house in Stow. I was trying to get an internet business off the ground but thanks to an accountant who didn’t do email and a vulture capitalist who thought I was going to give him half of the thing in return for working for him in deed, word and fact, that didn’t happen. Microsoft do the thing it did now. At least I got to be friendly with a six foot blond lesbian coder with a rubber dress. Not everybody can say that. But the boat thing…we visited boat yards all over the East Coast. Stood on docks looking at horrible plastic boats with fins sticking out of them, stubbed toes on bits of things that nobody even knew what they were any more, so much so that in one of those yards up a creek in Essex someone now thinks they’ve found Darwin’s little ship, the one he sailed on to write the Origin of Species. I wanted a wooden boat and I had about £10,000 to spend. It didn’t happen for all kinds of reasons then, but time goes on for the lucky ones. Yesterday I bought one. I didn’t pay anything like that. I first saw this lovely little boat in October or thereabouts. I’ve been going to this boatyard for years, thinking one day I might buy a boat there. Finally it’s happened. I’m just about to go down and see what needs to be done to get her ready for the water again. I’ll just put a pen and a thermos flask in my bag and I’ll let you know. 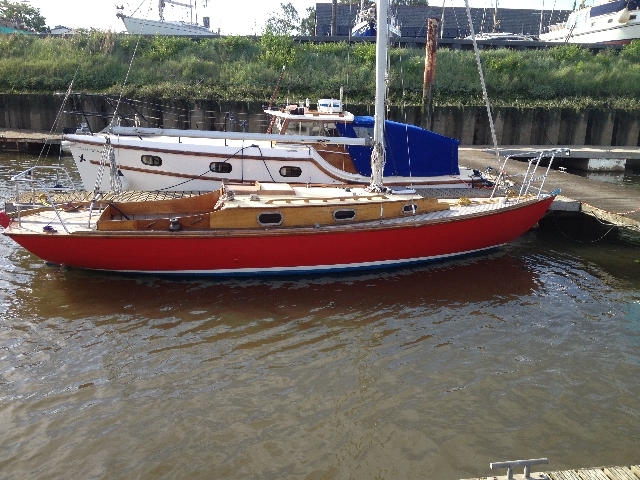 I’ve just bought a folkboat too – sight unseen off Ebay. I’d promised myself for years that a small wooden yacht really would be the good to own. As someone very kindly pointed out to me, if I didnt buy one soon I’d be too bloody old and knackered to enjoy it. The boat is in Felixstowe, must be fairly close to yours. My problem is I’m in Berwick upon Tweed. I have travelled down to look at the boat and am now trying to arrange to have it brought up here on a trailer. The previous owner was a writer too – you may even know him. Never buy a second hand old wooden boat based soley on a written description, especially from someone who makes a living from writing. Apart from the boat, we were impressed with Felixstowe or at least the area we stayed in. It was the first time we’d been away together since meeting up just over 3 years ago and we enjoyed just wandering about playing at being tourists. I’ve enjoyed reading your blog too. Now if i can only stop having sleepless nights about the boat………what if it sinks immediately on launching?